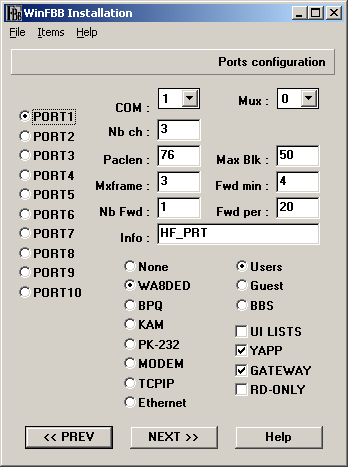 Port 1 at 300 bauds for HF, Port 2 is Loopback for (X)Net or internal test, Port 3 at 1200 bauds for VHF. In the example I using a COM1 for PTT and LPT3 for Loopback port. For Communications configuration in COM1 set for TFWin and COM6 for Winsock. 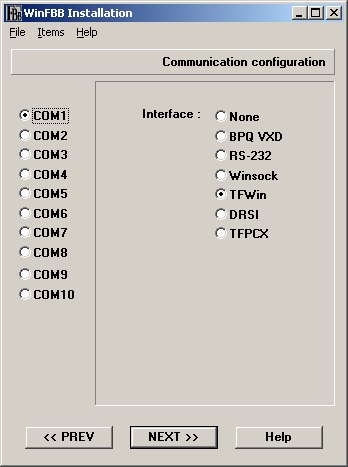 The TFWIN32.DLL original don't work, and you MUST replace it with a Pedro Colla LU7DID version available in the cx2sa.org download. If you don't delete and replace TFWIN32.DLL your Winfbb don't work with soundcard and AGWPE. Port 1 for HF, Port 2 for Loopback. Port 3 for VHF and Port 6 for TELNET. 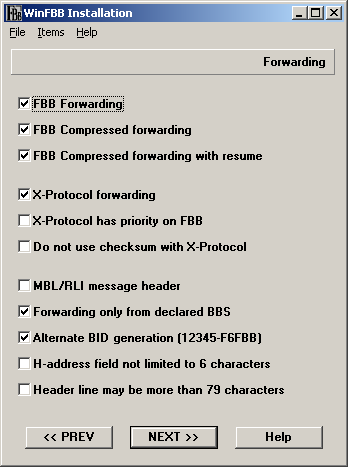 Don't modify in the BBS Information "Msg header" box. 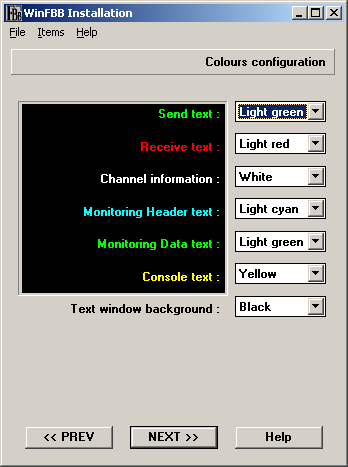 In servers I recommend you install a AUTO7P for automatic code/decode 7 plus files incoming at your BBS. Set Time-Out and maintenance task time. 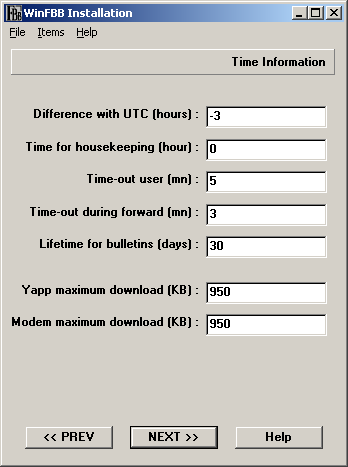 In the example, maintenance is at 00:00 local time. 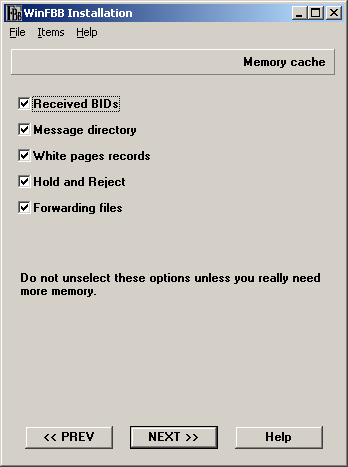 Set a colours and DON'T tag any options at Memory cache. The MID/BID will be configured accurately. 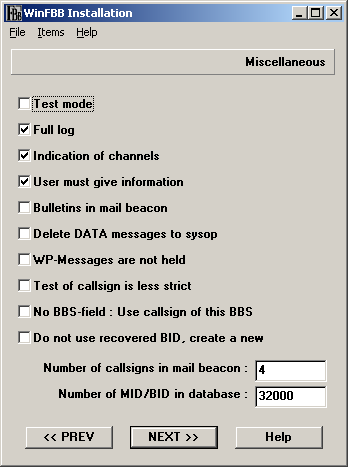 If your BBS works with FULL FORWARD is needed to put the value in the maximum (32000), but if alone receives some routes of bulletins, it should calculate that value multiplying the total of bulletins received in one month x 12. 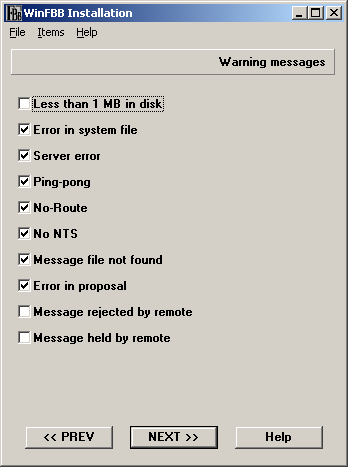 Not recommed you tag Message rejected by remote, because generate too much personal message when your remote bbs reject messages. El SysOp MUST BE access in firt time at the SYS command ONLY. Security Options after SYS command must be FULL. I recommend you set only a Paging for first connections. 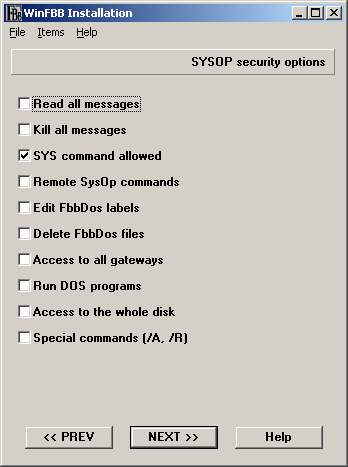 In the SysOp and UI keep in mind the path of WP bulletins.. In the example WP message are send to WPURY, and if you are not allocated in Uruguay, you MUST BE delete WPURY and send to other route or FBB Partner. I recommend to install a WINFBB in the original path (C:\FBB), because some a thirth part sowftare don't work. 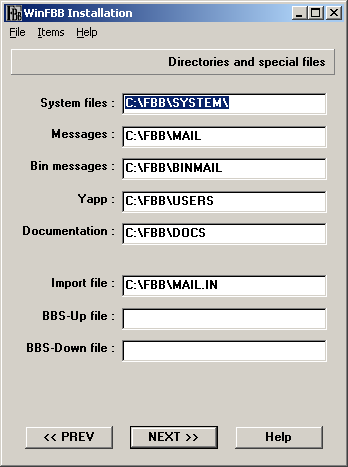 In the download section exist others examples of configuration for Winfbb 7.00e, and a .zip file with and screenshot. 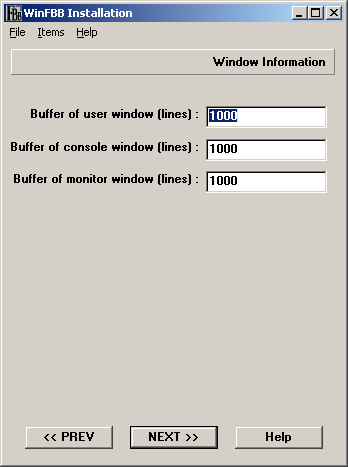 Winfbb 700e work in ALL WINDOWS VERSIONS, and to see details about W2K, W2K3, XP and Vista, go to English Text section.